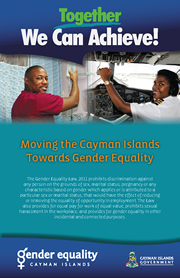 If a person has reasonable grounds to believe that they have been discriminated against as outlined in this Law, a complaint can be made to the Tribunal within 6 months from the date on which the alleged acts occurred. A complaint can also be made by another person other than the alleged victim of discrimination but the Tribunal cannot deal with the complaint unless the alleged victim consents. 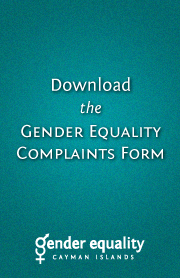 To file a complaint with the Gender Eqaulity Tribunal, please download the Complaint Form and follow the instructions on the form. Once the form is completed it can be emailed to get@gov.ky. When a complaint is substantiated, the Tribunal shall notify the complainant and the person against whom the complaint was made in writing. 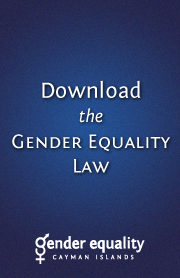 They shall issues directions requiring the discrimination to stop and for the persons to take remedial action within a specific time period, or they may require the person to pay up to $20,000 to the person aggrieved by the discriminiation. The Tribunal may also make an award for costs. If the complaint is found by the Tribunal to be frivolous, vexatious, or incorrect, the Tribunal shall notify the complainant and the person against whom the complaint was made and order that the complainant pay the costs incurred by the Tribunal and the person against whom the complaint was made. After filing a complaint and before a hearing begins by the Tribunal, the complainant and person whom a claim is being raised against may make an agreement and thus the claim would be dismissed. Both parties must however notify the Tribunal in writing of the terms of the agreement. A person aggrieved by the decision of the Tribunal may make an appeal to the Grand Court within twenty-eight days of the decision.